Med Instead of Meds was created by a group of nutrition and health professionals from NC State University and NC Division of Public Health. 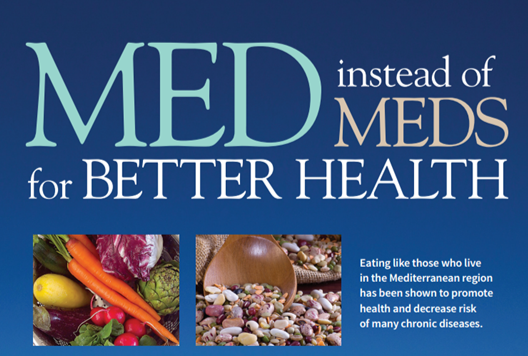 Eating the Med Way (Mediterranean) has been proven to protect against chronic illness. In some cases, eating the Med Way may even result in decreasing medications taken for blood pressure, high cholesterol, or diabetes. * Hence the name, “Med Instead of Meds”. We are passionate about providing people with the information and tools needed to make delicious meals for themselves and their families. We too are on this journey with you to transform our eating to the Med Way. *Check with your health-care professional before changing any prescribed medications. Classes include one hour of instruction and one hour of hands-on cooking along with taste-testing at the end. Topics covered include: Change Your Protein, Swap Your Fats, Eat More Fruit and Vegetables, Snack on Nuts & Seeds, Make Your Grains Whole, and Rethink Your Sweets! Cook Smart Eat Smart is a 4-week cooking class designed to teach participants how to prepare simple, healthy and delicious food for you and your family through simplicity – simple healthy preparation techniques, simple ingredients and simple equipment. This class is meant for all-level cooks looking to learn more about healthier preparation techniques and topics that are good for the family and the wallet! Dates for 2018 cooking classes have not yet been scheduled. If you would like to be notified when they have been scheduled, please fill out the form here: http://go.ncsu.edu/fcsinterest.